See also: Great Dismal Swamp; Pocosins. Most of the largest remaining swamps (or "dismals," as early settlers called them) in the eastern United States are located in North Carolina's coastal plain. 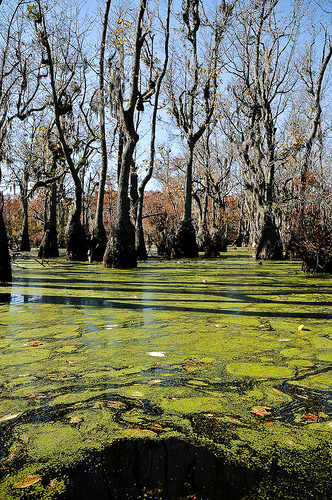 Much of North Carolina's swamplands are bottomland hardwood river swamps, while other swampy areas, including the mysterious Carolina Bays, are in fact pocosins-naturally occurring, freshwater evergreen shrub-bogs that are elevated above nearby lands. The definition of this Indian word, variously spelled "percoarson," "poquosin," and "pequessen," is "swamp on a hill." The best-known North Carolina swamps include the Great Dismal Swamp National Wildlife Refuge, the Roanoke River National Wildlife Refuge, the Alligator River National Wildlife Refuge, the Pocosin Lakes National Wildlife Refuge, the East Dismal, the Great Alligator Dismal, the Little Dismal, the Angola Swamp, the Holly Shelter Swamp, the Raft Swamp, the Gum Swamp, and the Green Swamp. The alternating nature of North Carolina's eastern territories (rivers, sounds, swamps, and forests) gave early travelers considerable difficulty moving from north to south, giving rise to a correspondingly considerable negative reputation for the coastal plain and sound country as being wet, wild, impenetrable, interminable, and monotonous if not downright terrifying. Along with the timbering operations that have gone on since European colonization, the North Carolina swamps have seen military activity during the American Revolution and the Civil War; been havens for escaped slaves (some of whom gathered and formed colonies and redoubts, while others traveled in secrecy from swamp to swamp); served as sites for illegal distilleries, such as the famously huge moonshine operation in East Lake during Prohibition; and been enormously altered by large-scale draining, land-clearing, and farming operations, particularly in the third quarter of the twentieth century (for example, First Colony Farms on the Albemarle peninsula and Open Ground Farms in the Open Ground Pocosin of eastern Carteret County). Because of the more recent allied efforts of many conservation groups and state and federal agencies, significant eastern swamp and wetland territories have become state forests, game lands, and national wildlife refuges. However forbidding the swamps may still seem to much of the population, there has nonetheless been a tremendous change in the general attitude about the necessity of preserving and protecting these swamps and lowlands as filters, habitats, flood absorbers, and incomparable sources of renewal in every possible regard. Bob Benner and Tom McCloud, A Paddler's Guide to Eastern North Carolina (1987). Brook Meanley, Swamps, River Bottoms, and Canebrakes (1972). bumeister1. Duckweed and swamp tupelo (Nyssa aquatica) Merchant's Millpond State Park. Digital photograph. Taken November 9, 2008. Available from Flickr: http://www.flickr.com/photos/bumeister/3104652467/ (accessed May 14, 2012).